To sidestep all the little oddities that PJ allowed in this one. The Fellowship is one of my all time favourite movies (and books), but there was still a lot of things that felt decidedly odd. The most prominent in the first movie was that the Nazgûl were a bunch of losers. One sits right on top of it’s prey and does not notice them. They are outrun by hobbits, while the Nazgûl themselves have horses. They don’t notice that the beds are stuffed with dummies. They don’t kill the hobbits even when given plenty of time. Five of them are defeated by Aragorn alone (why are we worried about these guys?). They see the flood coming and they turn to ride along the river, for long enough that they would have made it to the other side had they just kept moving, or turned back. They fail utterly at everything they do in this movie. That’s not very scary. I’ve tried to bring out the best of them, and portray them as the terrifying opponents they should be. There are several other things that are silly or dumb, and I’ve given my comments to why I’ve changed things in the cut list below. My overall intention was to bring out the best of this awesome movie, trying to improve on something that’s already great. Not a small task. I have had no intention of bringing this closer to the books, I am only interested in what works in the movies themselves. Cut list and comments included on the disc. Action Hobbits - a short tribute to the fact that the hobbits are action heroes in PJ's LotR. Removed “Victory was near”. How could victory be near with Sauron left? Sauron exploding does not topple the entire army. It just seems like everyone close by should have been killed. Cut Bilbo searching franticly for the Ring. It doesn’t have to be overly clear yet about the rings effect. I feel it distracts from the feeling of the storytelling at that moment. Cut Gandalf banging his head. This cut is back! It’s a rather silly way of presenting the character of Gandalf. Cut Merry and pippin stealing a rocket. To make that work Bilbo hiding at the party also had to go, and we don’t see the dragon fireworks. Introducing Merry and Pippin can be done in other ways, this one I don’t like. Nor do I particulary like the dragon scene. Cut Frodo and Sam seeing the wood elves. Dialogue meant to introduce us to the world? But coming from them it feels odd. Also Frodo and Sam switch places during the scene, and that bugs me. Removed Gandalf running to several doors and them closing. It’s meant to heighten the excitement, but has the opposite effect. Cut most of the battle between the wizards. It’s a kinda silly battle. Now Saruman is obviously more powerful. The Nazgul does not sit right on top of the hobbits, nor do they distract it. Now it’s scary but not failed. Once the Ring is resisted the Nazgul moves off. Cut Nazgul finding hobbits in the forest. They are not slower than hobbits on foot anymore. Cut some of Sauron’s voice in the inn. It’s less scary with words. Removed some of the sleeping hobbits and posing Nazgul. They seem scarier when they are more to the point. Also I don’t like this kind of tension-heightener that the interposed sleeping hobbits and Nazgul images are supposed to be. It was overdone here, and I’ve shortened it. Removed scene with Saruman contacting Sauron. Saruman is more threatening as an independent player. That he starts building an army is because he wants the ring himself! Removed “The trees are strong my lord. Their roots go deep.” ” Cut them all down”. We understand anyway, don’t need this overly clear line. And I don’t like the orc voice. Only 1 Nazgul finds them on Weathertop. And it’s damn scary! Thank you Kerr for providing a crucial shot of the lone approaching Nazgul. Removed “What’s this? A ranger caught off his guard?”. Yeah, why is he? And it doesn’t make Arwen’s introduction more potent or interesting. Arwen and Aragorn do not argue about who will ride. They just know who is the best suited. And I get a chance to add a little romance by changing the translation of the spoken elvish. Removed “What are you doing? Those wraiths are still out there!”. Why is Sam so stupid? Removed Nazgul claiming the halfling and Arwen challenging them. They are scarier when they don’t make demands like that. The flood hits them too fast for them to move out of the way. They aren’t stupid anymore. Cut Arwen getting very upset that Frodo is dying. She still cries out, but the worst parts are gone. Removed Frodo saying that he is ready to go home again. I want him to appear more effected already, not wanting to leave the ring. Cut any talk about Aragorn choosing exile. Men are not without power, and Aragorn is only waiting for his time. Time change, the council of Elrond. Two reasons. It makes the revelation of Aragorns heritage more potent. It makes the next scene with Boromir and Narsil much more meaningful! Boromir does not question Aragorn on who he is. Because he already knows. And we get to end the first part with a kiss! Aragorn does not refuse his heritage. The burden is upon him, and he is ready to shoulder it. The Watcher battle at Moria is shortened. If it had more time it should have killed someone. Troll action is drastically shortened. Nor do the hobbits kill any goblins. A little over the top in some parts, and I really don’t get why the hobbits get to be action heroes. The goblins do not climb walls like insects. Do I need to? A little less of Boromir almost falling down. Didn’t add to the tension. They do not jump over a hole in the stairs. What an anti-climax! A long scene about jumping a hole when they are chased by a Balrog. Removed “The enemy knows you have entered here. What hope you had in secrecy is now lost”. Which enemy? And what do they know? This makes things more unclear and poses questions never answered. Galadriel does not say that “he will try and take the Ring” The temptation is back! But this part isn’t very good, or at least I think so. It is enough that the Ring will break the Fellowship. Galadriel does not explain about her Ring. No need to. Feels off. Sam does not ask for a dagger. It’s not his character to question the gift of the mighty Galadriel. Elvish translation change – Aragorn does not wish for Arwen to go to Valinor. Galadriel speaks of Arwen’s choice and what it will mean for her life. Because he accepts her choice and her love. Cut the Uruk-hai running. Shout out to Kerr, I found this an excellent choice, and went with it myself. Removed Aragorn talking about Minas Tirith as “your city” to Boromir. He does want to go there, but not like this, with the ring. Cut some of the first blows Aragorn makes against the horde of Uruk-hai. He retreats instead to a better position. Cut Boromir’s first intervention to save the hobbits. It’s not a bad scene, but a little odd, and has hobbits stabbing a couple of orcs too. Removed Legolas killing orcs that fall over randomly. Why do they do that? Removed Uruk-Hai felled by magic hobbit stones, and other orcs randomly dying near Boromir. They are strong and scary, not fluffy bunnies. And they have helmets for “#*^’s sake! Cut short the execution aiming on Boromir. It just looks silly. Sam does not go limp with glazed eyes under water. That would mean too long time. This cut turned out better this time around. I know It's not a faithful to the book edit. My comments would take that into account. For the first part (first DVD) I rewatched the original movie to see the changes. At Bilbos's party I would try to keep the dragon's firework scene. 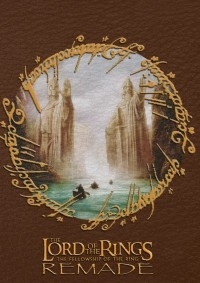 With the forthcoming release of "The Hobbit" it might be a good recall of it (better if you watch them consecutively). Also, there is a missing scene between Bilbo and Frodo that is not bad. Otherwise, good editing and you removed Merry and Pippin (Thanks). Cut some Sam's complains about sleep on the floor. Good choice. Removing Elves's parade. Works well but also it's not a bad scene to let it in. Saruman versus Gandalf. Fantastic job. I had in my mind to do something like this and you just did it perfect. Seamless job. No issues with the sound. Thanks for it! First encounter with the Nazgul. Much better in general but I would try the Nazgul to don't get off the horse. I think that way it is going to be more frightening, also, it seems to me, he is too much close to the Hobbits, and, of course, to the ring. Must be the one blind, deaf, an without the sense of smell, Nazgul of the nine. Lucky Hobbits. Clever edits at the river. Works much better for me. Nice choice removing the Nazguls stabbing the Hobbits. I hate that scene. They look silly. Weathertop scene. We have here one of the top edits in the movie if not the best. Despite it is a bit harsh in some transitions, the overal is wonderful, very well done. I had to rewatched because I was wondering how you did it. Still don't know how you tricked the Nazgul coming through the mist. Exceeded my initial expectations. Very refreshing scene. Now stating the hard part. I personally dislike-hate some of the incoming stuff (from the original movie); Arwen, Elrond and Rivendel in general. Arwen first appearence. I dislike this scene but it's imposible to fix (where will be Glorfindel). At least you did it better removing some silly lines. Arwen don't caught Aragorn off guard, and removing the last lines of Sam: "What are you doing? !Those Wraiths are still out there!". Thanks. Good choice removing a Nazgul trying to catch Frodo in the chace. I don't like Arwen casting the spell. It seems to me she is too much powerful. She, all alone, defeats the Nazgul. It dosen't feel right. But, this is just a personal taste. Thanks for removing the Nazgul going in the same direction of the wave and the last lines of Arwen "What grace is given me..." but it's still weird how she behave with Frodo. She just meet him. Don't know why is she so concern. Maybe cut the scene a bit before, when Frodo is still on the horse. Some good cuts in Rivendel but I don't like the council and you leave it, I think, as it was. Two things bother me; Legolas responding to Boromir (don't know why he is so upset) and, more important, Gimli hitting the one ring with the axe. Augh, it's too silly even for him. Please, think about removing that. Moria. You did some cuts at the battle scene and even It's well done I think it's good stuff to miss. You removed the monkey orcs, thanks, and the ladder scene. I understand why but I like that scene. I don't like the first appearance of the elves, pointing a bow at them very, very close. I don't know if it can be fixed. Also, Galadriel's telepathy feels weird to me. Sudden transition with the music at 1:00:39. There is an issue at the final part of the movie, when Aragorn let Frodo to go alone to mordor. Think about it. Aragorn who is a ranger with a lot of experience would let a Hobbit without any experience, go alone, even without Sam, with the one ring toward mordor? It's a totally suicide and jeopardizes the safety of the mission. I don't know what the scriptwriters were thinking about when they wrote it. I know it's hard to fix but maybe you can do something. Same for Merry and Pippin. We thougth they were friends but, hey, maybe they just hate Frodo. They must be thinking something like; "Go, Frodo, go alone and die in mordor". The cuts are well done but again, you cut some good fight stuff that I like. I miss when Legolas shoot one after another arrows. Even I don't like him making odd movements It should be noted that he is an elf and It is one thing to do that kind of stuff and another the things he do in the next movies (to kill an mûmakil is a serious stuff). There is another sudden transition with the music at 1:08 but it's not a big deal. The overall edition is very good. Amazing work with the sound transitions and some scenes are a huge improvement from the original (Saruman fight, Weathertop, Bree...). Let me emphasize how good is the fight scene between Gandalf and Saruman (even taking into account that the most remembered will be the Weathertop's scene). Spelledaren gets elevate it to new heights, thanks to a very good job of editing. Getting a more serious scene, forceful and convincing. It is, in short, a sample of their good work. It's a pity that you don't go for a more faithful (to the book) edition because I believe you would do a great job. The missing of some fight stuff in moria and in the forest at the end of the movie. And the biggest of them; Aragorn's decision toward Frodo (same for Merry and Pippin). Oh, and the video quality. It have saturated colors and some issue when a subtitle is displayed. I would be better if you could do it in HD 1080 or, at least, 720. I would recommend this edition to the people who enjoy the original movie and wants an improved version. The faneditor's approach of leaving the core of the film more or less as it is but tweaking it where necessary is not without merit. After all, the film is great to begin with, and most of the alterations work. I liked the recutting of the Black Riders attack at the Prancing Pony, and the re-editing of the scene at Weathertop is a notable success: I'm not sure anything will ever satisfactorily solve the trilogies problem of the Nine being too powerful formidable when it suits Jackson and not formidable enough when it doesn't, but the faneditor deserves credit for trying. Like others, I was not convinced by the jump to Rivendell. Some cuts, such as the Black Rider moving off when Frodo resists the ring, almost worked, but felt a little unnatural. Nonetheless, the faneditor succeeds more often than he fails. The faneditor obviously likes much of the extra material from the extended cuts, which I have always felt tends to drag the films down. This is ultimately preference — and with films that I like I often just take out what I don't like and keep what I do — but the edit might come into its own more with some of the extra material removed, if only to improve the pacing. There were a few scenes in which the quality dipped a bit, but taken as a whole the quality was high for a fanedit. The English subtitles for the Elvish were not good. They appear to have been designed for televisions with exact scan modes and are *slightly* cut off in 16:9 mode, which is how most DVDs are designed to be displayed. This could be fixed. The 5.1 audio is one of the edit's strengths. Given that music is playing almost constantly in this film, the absence of hard cuts is impressive. It is obvious that a great deal of work went into the audio editing. I didn't notice any real problems and — again — the Weathertop sequence stands out as being particularly well done. This aspect of fanediting doesn't really do much for me, but I have to confess that I really didn't like the menu. It didn't look very well laid out and played in 4:3 in my player. Having a video sequence at the start was a good idea with potential for improvement, but I actually thought that the feature had started and found it a little confusing. I am sure that the faneditor could have a go at cover art, if only to encourage people to have a look at his edits on the main page. The scene selection looks fine though. I actually enjoyed the extra. :-) Was it silly? Yes, but it was also fun, and I found that it provided welcome light relief after the serious tone of the film. This is tricky. I would prefer a more streamlined edit closer to the theatrical cut in both pacing and content, but I did enjoy this, and feel that the faneditor implements his vision for the edit consistently. I will have to dock a mark for the subtitles and the poor presentation because they did irritate me. This is an enjoyable edit that deserves to be watched more — judging by the ratings — than it has been . The faneditor has good ideas, and I sincerely hope that he will produce a second version at some stage. With such an extensive review posted by Boon23, I doubt that I can add anything to what he has already written. I would like to echo what Boon23 writes at the beginning of his review; I have never cared whether any of the myriad of LOTR fanedits are more closer to the books or not. (I have Kerr’s version and his updates and enjoyed all 6 “books”). I grew up reading LOTR and enjoyed PJ’s movies immensly. Liike Boon23, from time to time, I will get the desire to watch a LOTR edit. I have always been of a mind (with the books as well as the movies) that there is some fat that could be trimmed. This edit does that: gets rid of a lot of “bloat” and makes a nice turn or two in a some areas other edits haven’t really addressed. I, too, was very apprehensive about the DVD menu, seemed very basic. The edit of this movie is actually very good (see Boon’s review for details). I definitely like the more “menacing” Nazgul and Saramon. For my “two cents” worth, if you have not watched any version of the LOTR originals or edits in a while, then this will be worth your time. Is it better or worse than any other version – not generally – just a different take. There are a wide variety of edits of this movie out there and this is another one that is worth watching. There have been many LOTR fanedits since the movies were released. Many of them were not approved on fanedit.org for having huge flaws or truly bad image/audio quality. Then there are the famous purist/book cuts, which I never was a fan of, because what I have seen of them always destroyed the mood of the movies for me. I for one simply don’t care if it is closer to Tolkien’s original idea, but if it works as a movie for me and keeps me entertained. I am a huge fan of the original movies and no fanedit will change that. Still from time to time I enjoy watching a different take, so I sat down and watched Spelledaren’s version of THE FELLOWSHIP OF THE RING: EXTENDED EDITION. I did not read the fanedit info to see an unspoiled version and experience the movie as it flows. This is not always an easy task, especially not, if one knows the original really well. But I have made the experience that once I am getting into the flow, my comparisons stop and I can enjoy a present watching experience. 1. Removed Gandalf running to several doors and them closing. It’s meant to heighten the excitement, but has the opposite effect. 2. Cut most of the battle between the wizards. It’s a kinda silly battle. Now Saruman is obviously more powerful. The one time Gandalf fires back felt rushed. Otherwise this worked really well. Saruman seemed incredibly powerful. 3. The Nazgul does not sit right on top of the hobbits, nor do they distract it. Now it’s scary but not failed. Once the Ring is resisted the Nazgul moves off. This scene did feel a bit choppy. It worked though. 4. Cut Nazgul finding hobbits in the forest. They are not slower than hobbits on foot anymore. It worked very well for me, even though the riders have no introduction here. 5. Removed some of the sleeping hobbits and posing Nazgul. They seem scarier when they are more to the point. Also I don’t like this kind of tension-heightener that the interposed sleeping hobbits and Nazgul images are supposed to be. It was overdone here, and I’ve shortened it. Good call. This scene really works better this way. 6. Removed scene with Saruman contacting Sauron. Saruman is more threatening as an independent player. That he starts building an army is because he wants the ring himself! Again: good call. Saruman is in this edit much more than just Sauron’s servant. 7. Only 1 Nazgul finds them on Weathertop. And it’s damn scary! Thank you Kerr for providing a crucial shot of the lone approaching Nazgul. It feels choppy and the image quality varies. Aragorn pops up from nowhere and the Nazgul is defeated really quickly. although I understand the desire to make the Nazgul stronger (and I agree that this would be needed), the new scene did not convince me. 8. Removed “What’s this? A ranger caught off his guard?”. Yeah, why is he? And it doesn’t make Arwenâ€™s introduction more potent or interesting. This all worked really well, with the exception of the flood. Event hough it comes a lot faster it still is a bit weird. But overall: great work. 9. Cut Arwen getting very upset that Frodo is dying. She still cries out, but the worst parts are gone. Now that scene felt now particularly strange and incomplete and jumps to Rivendell. Didn’t work for me at all. 10. Cut any talk about Aragorn choosing exile. Men are not without power, and Aragorn is only waiting for his time. I found this a bit confusing. 11. The Watcher battle at Moria is shortened. If it had more time it should have killed someone. Troll action is drastically shortened. Nor do the hobbits kill any goblins. A little over the top in some parts, and I really donâ€™t get why the hobbits get to be action heroes. All worked great, but the city part felt chopped. 12. A little less of Boromir almost falling down. Didnâ€™t add to the tension. The result is a choppy scene change. Very obviously cut. Not good. 13. They do not jump over a hole in the stairs. What an anti-climax! A long scene about jumping a hole when they are chased by a Balrog. I always liked that scene kind of. It adds a bit if humor to a very sinister scenario. But it is not really missed, when it’s gone. Sam does not ask for a dagger. Itâ€™s not his character to question the gift of the mighty Galadriel. Elvish translation change – Aragorn does not wish for Arwen to go to Valinor. Galadriel speaks of Arwenâ€™s choice and what it will mean for her life. Because he accepts her choice and her love. 16. Cut some of the first blows Aragorn makes against the horde of Uruk-hai. He retreats instead to a better position. The Uruk Hai encounter felt very choppy and was one of the worst parts of the fanedit for me. I don’t think any of the cuts were necessary or did improve the tension. 17. Sam does not go limp with glazed eyes under water. That would mean too long time. This cut turned out better this time around. Good call. It still feels unlikely that Frodo could have saved him without getting wet. As you can see, there are quite a few inconsistencies for me. Most things worked great, others really did not. I was getting a bit bored in Lothlorien and think the theatrical cut is more to the point there. Overall I was mostly entertained and realyl impressed by some of the decisions of Spelledaren that worked great. The video quality was in most scenes great. There were a few scenes with varying image quality in close-ups and a few stutters. audio quality was great. I did not notice a bad audio cut, which is a great achievement in such a heavily scored movie. The fanedit comes on 2 SL DVDs, which is not a great choice for ONE movie. 174 minutes is long, but one DL would have been the better choice IMO, especially because the menus are not nice and look pretty cheap. The chapter selection menus have custom titles for each scene, which is a nice addition. Unfortunately there is a flaw on disc 1 that makes you click twice to go back to the main menu. The custom title was not well inserted and very obvious, especially because of the stutter that came with it. The end credits are cut super short and are not custom. There are no extras and no cover art. The presentation leaves quite a lot to be desired. For the presence of menus, custom title and chapter menus I am giving 4 stars. There are some really well done scenes and it is an enjoyable fanedit and a quite well done and promising firstling. What I particularly like about it is that Spelledaren tried some truly daring cuts and alterations and succeeded most of the time. I was entertained by the fanedit, but will not watch it again probably. 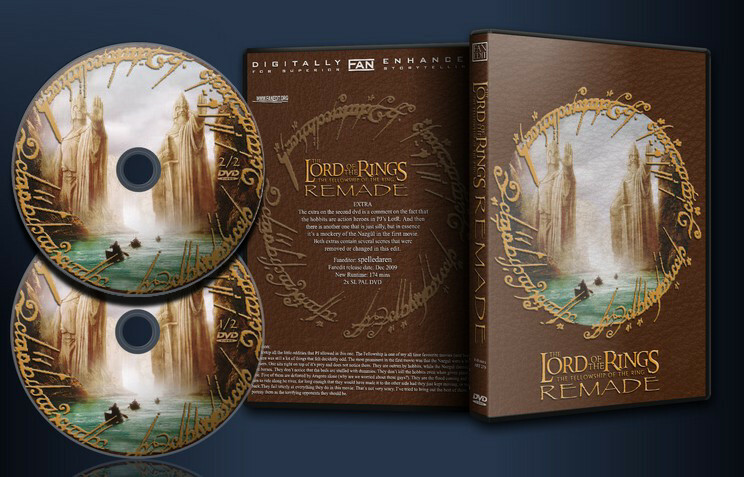 Recommended for those who are interested in a fixed cut of LOTR other than the book cuts. Thank you, spelledaren, for creating it.